That drip, drip, drip down your back during exercise is your friend—sweat happens so we don’t overheat and pass out. But the process of sweating is very individual; every body has its own perspiration point. So should your workouts be hot and sweaty or cool and dry? Experts say it’s largely a matter of personal preference, and while studies point to the importance of “vigorous” exercise, that doesn’t directly translate to “sweaty” activities. Let’s break it down. On the other hand, people who love Bikram yoga or super-sweaty SoulCycle classes seem to revel in their perspiration-filled workouts. “Some people just don’t feel like they’ve exercised hard enough unless they are pouring sweat,” says Yearous, adding that if you’re into hot workouts and you stay hydrated with water while you’re exercising, that’s great. Just the fact that you enjoy them will help increase your fitness because you’ll go more often. Campbell notes that according to the American College of Sports Medicine, the ideal temperature for indoor exercise is 68 to 72 degrees F, and Yearous recommends small temperature variances based on the type of exercise you’re doing. “It should be cooler in a Zumba/dance class working nonspecific muscle groups in tandem,” she says. “If it were too hot, people would slow their movements and burn fewer calories.” But in a strength and conditioning class where the instructor is isolating muscle groups for specific exercises, Yearous says the temperature should be slightly warmer so the muscles don’t get cold and tighten up. In the end, getting a good workout is less about sweat output and more about exercising regularly and including some vigorous activity in your routine, which are the real keys to optimal fitness. So if you love to feel that drip, drip, drip, go for it—and if you don’t perspire much during your gym classes but you feel strong afterward… well, don’t sweat it. 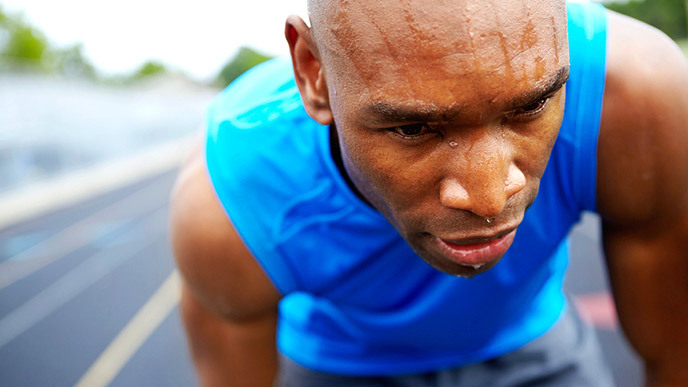 The New York Times: Ask Well: Is It Good to Sweat?